Support both HDR mode and STD mode. Imporved the noise performance and dark current performance. If your camera is QHY42 and want to upgrade to QHY42PRO. Just contact QHYCCD.The upgrade is only the FPGA code upgrade. It can be upgraded in the QHYCCD oversea repair/service center. Or you can also ask QHYCCD to ship you a FPGA upgrade cable to DIY. After this upgrade. The QHY42PRO will have a remote FPGA upgrade capablity. And for future FPGA upgrade, it does no need the download cable anymore. It can be upgrade via USB. QHYCCD supply the FPGA upgrade software. CMOS clock will effect many behaviours of the camera. High speed cmos clock can bring higher frame rate, but normally speaking the noise performance, like the FPN noise , readout noise performance will decrease. The QHY42 is use the 300MHz fixed cmos clock and frame rate is 24FPS. While QHY42PRO support both 150MHz,300MHz and 600MHz. Frame rate is 12FPS,24FPS,48FPS. 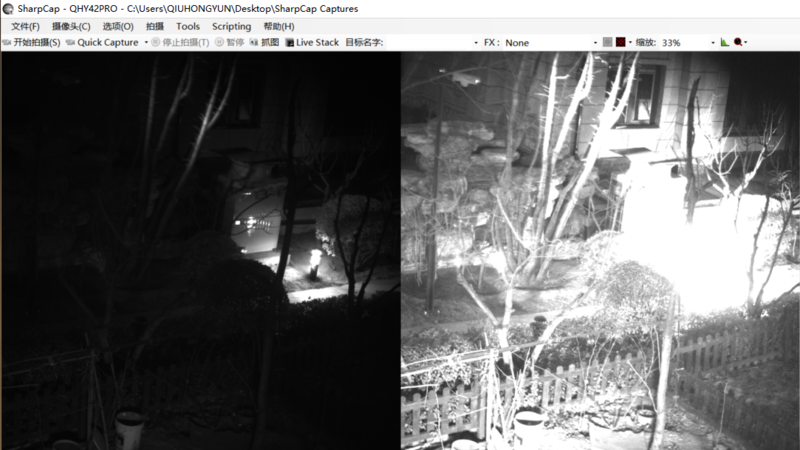 From the image results, the 12FPS looks have best performance on both readout noise and the FPN noise. QHY42PRO support both HDR and STD mode. In HDR mode. QHY42PRO outputs 4096*2048 HDR image.One 4096*2048 image consists two 2048*2048 image. The left image is the low gain channel, the right is the high gain channel. Low gain channel has much bigger fullwell up to 89ke, but readout noise is higher. The high gain channel has very low readout noise but the fullwell is much less. With the HDR technology you can get both the advantage of the high fullwell and ultra low readout noise. Unlike other cameras. QHY42PRO has not combine this two image into a "16bit" image. QHY42PRO output the RAW images. For astronomy applications it is good that process the image in RAW conditions. STD mode outputs only one 2048*2048 image. It will have less data bandwidth. And it can get high frame rate tha 24FPS. In default , QHY42PRO works in HDR images. If you want to use the STD mode, You have to wait the QHYCCD release the newer SDK to support multiple mode. 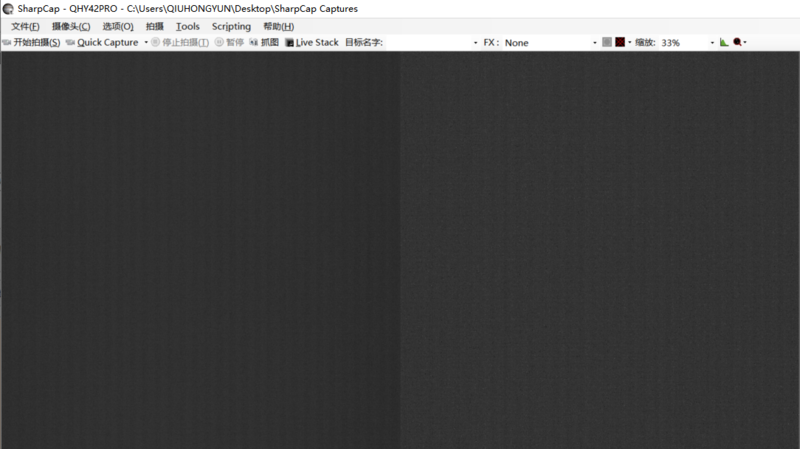 QHY42PRO uses the SharpCAP software as th default image capture software. In this software, QHY42PRO works in Live Video Mode. After start the Sharpcap software. You will see the live video . Resolution is 4096*2048. The following two images show the HDR results. When right image is very right. The left image still not saturated. You can set the exposure time in the right tools box->Camera Controls. If you need longer exposure time, you can check on the "LX mode". There is some pre-set exposure time and you can select them from the Quick Picks list box. Becaus in HDR mode. There is two analog gain. This two analog gain is fixed in QHYCCD SDK and you can not change it. In SharpCAP gain setting you only changed the digtal gain. (If you want to set the two channel to other analog gain setting. Please contact QHYCCD). For QHY42PRO,SharpCAP has two speed options : Speed0 and Speed1. This is the FPN noise condition in the bias frame,at maxium digital gain. 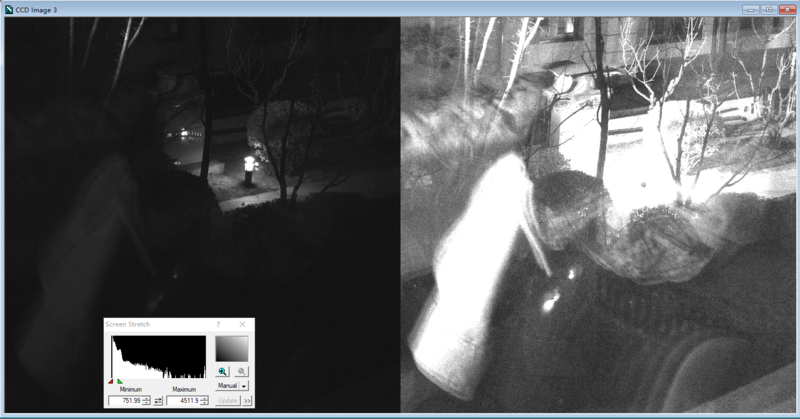 This is the results of realtime dark frame calibrated image The background is very uniform and you can see any FPN noise. 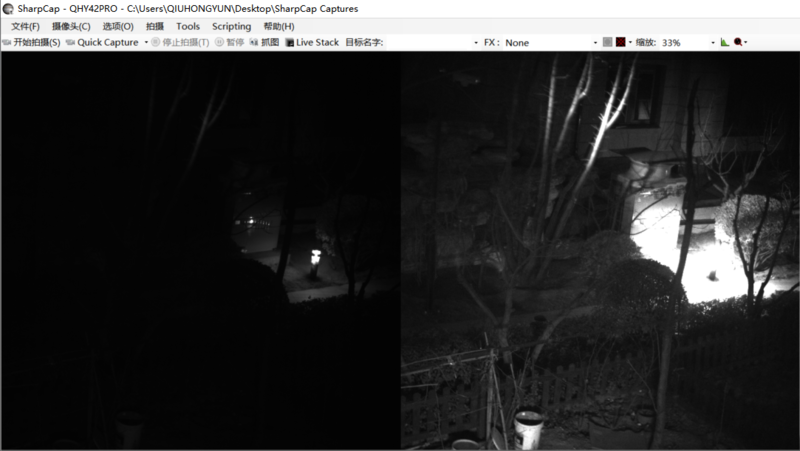 Since the FPN noise calibration will subtract the dark frame. It will take over a little of the dynamic range. So we suggest you use the MONO16 to do this. MONO16 is actually use the 12BIT of the CMOS output, it has 4096 levels. While the MONO8 is use 8bit and it is only 256 levels. 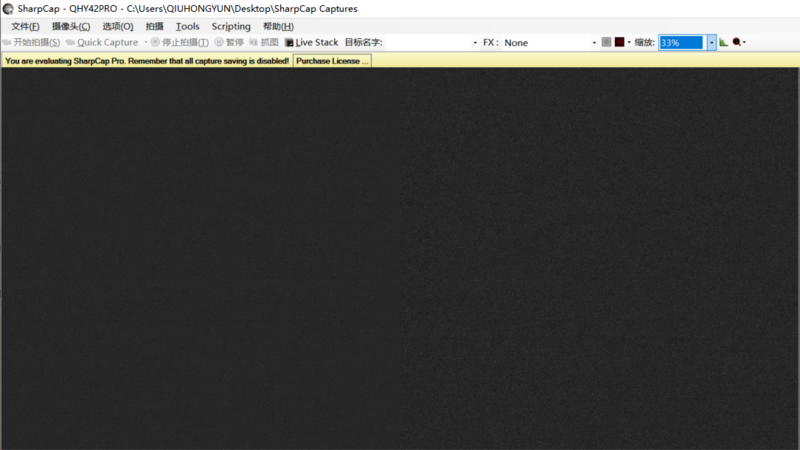 EZCAP_QT is the default image capture software for single frame mode. 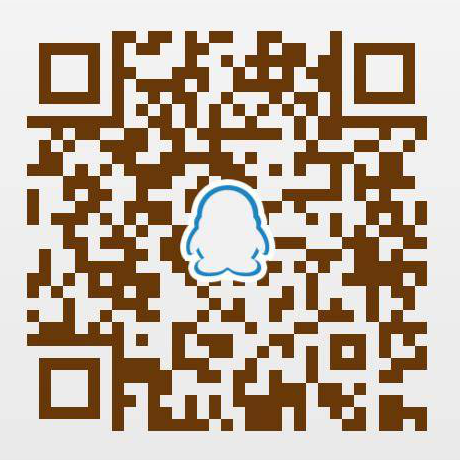 It can be download in QHY42/PRO download page. In video mode, the camera is free running frame by frame. You can not ask camera to start a frame. For single frame mode. the exposure is sync with the button that you click the "Capture". So sometimes the single frame is better for controlling. For example, when you rotate the telescope, the live video will continous to capture and it will capture the image during the telescope movement. But for single frame, you can ask camera do not begin to exposure, till the end of the movement, then you can ask camera to take a frame. This is the UI of the QHYCCD EZCAP_QT software. 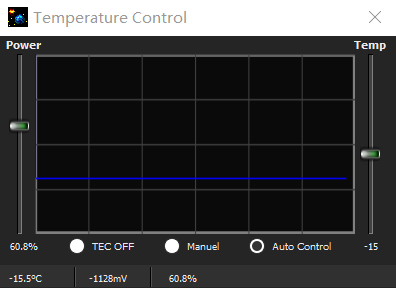 You can set the temeperature from the Menu->Camer Setup->Temp control. There is two way of control mode. The Manual control and the auto control. In manual control, you can use the power scrollbar to set the TEC power. From 0% to 100% of the power. In this mode, the temperature is not regulated. In auto control. You can set the target tempeature with the temp scrollbar on the right . We recommand you to use the gain0. Because in HDR mode. The analog gain is fixed in the QHYCCD SDK. The gain appear in EZCAP_QT is the digital gain. Because of EZCAP_QT is taking the 12bit image. So it is not necessary to use digital gain. You can use the histogram stretch to get the same result of digital gain. Most of the third part astronomy software support the ASCOM driver. QHYCCD has the all-in-one ASCOM driver which support most of QHYCCD camera via QHYCCD SDK. 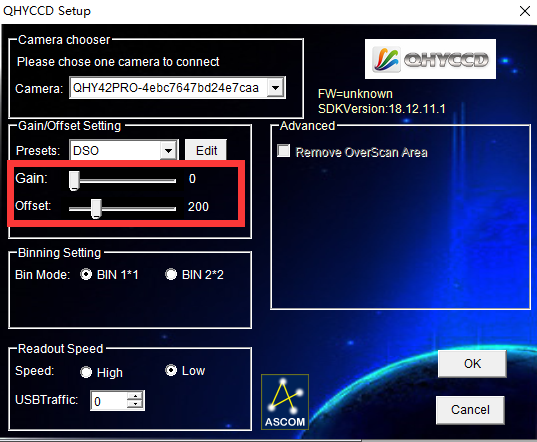 Please go to QHY42/PRO download page to download the QHYCCD ASCOM Driver and install it . For first using. The Gain and Offset should be set . We recommand to set the Gain to 0 and Offset to 200 so start with. In SDK the QHY42PRO anlog gain is fixed. The gain appear here is the digital gain. Since the ASCOM is always use the 12bit image output. So it is best to set gain to 0 to avoid the digital gain active. 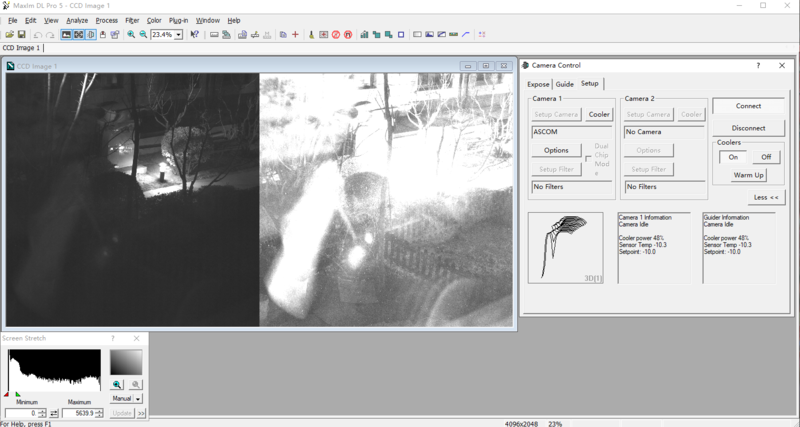 The following picture is that the QHY42PRO working in the MAXIMDL software via QHYCCD ASCOM driver. This is a one second exposure at -10C. You will see in high gain, there is some thermal noise. And in the low gain channel, there is some vertical FPN nosie pattern. This is a 1sec dark frame. 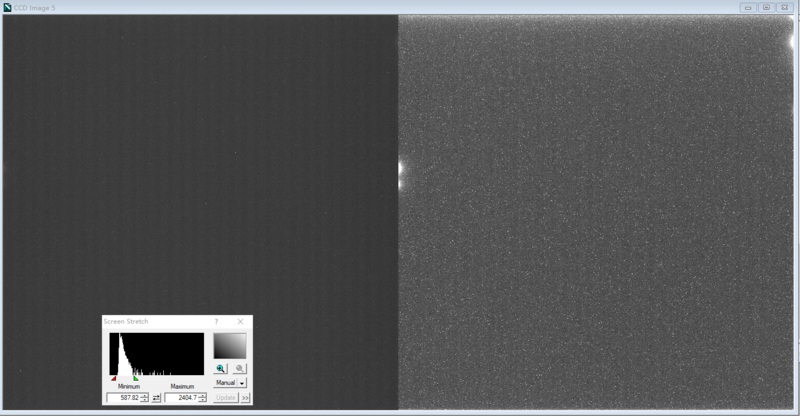 This is the image after dark frame calibration. You can see both FPN noise, amplifer glowing and the thermal noise is perfectly removed. 1. The CMOS sensor temperature need to wait at least 15 minutes to get stable. Although the temperature come to the target temperature, you still need to wait about 15minutes to let the CMOS sensor get stable. Because the temperature sensor location is on a metal back of the CMOS sensor. even the temperature sensor get the target temperature, the CMOS sensor may not. The CMOS sensor need more time to get temperature balance. The GSENSE400 has the typical RBI. RBI is not easy to be seen in short exposure time <100ms. But it can be seen when exposure time more than 1sec. Most RBI will disappear if you block the light in 10-30seconds. But a very weak RBI will remain for more longer time. The current QHY42PRO has no RBI pre-flash circuit. QHYCCD is designning a new heatboard with RBI LED on it. In the hardware design of QHY42PRO, it suppor both Trig-In and Trig-Out signal. The Trig-Out signal can be the Vsync signal which indicate the exposure end of one frame. This two signal has not be connect to back case of the camera. If you need such a signal . Please contact QHYCCD to obtain the back case and the connector, Which can be connect with the Trig-In,Trig-Out socket of the board inside. Althoug the video streaming mode is free running. But QHY42PRO support the burst video mode. It allow a start signal from software or from the Trig-In hardware port. Camera was in IDLE statu. And when the camera get this signal, camera will start a video sequence clip. The number of this clip can be define via QHYCCD SDK API's. If you need this mode please contact QHYCCD for details. The hardware frame sequence stamp can also be added to embedded into the image if required.